Mark was a science teacher for over 10 years before taking the lead at CrossFit Weymouth. His background in education and coaching a variety of water sports means he brings a huge wealth of experience and expertise to the coaching team. Mark has demonstrated clearly in his own CrossFit journey that hard work really does pay off. He is driven by the desire to help all members, from kids upwards, to achieve their personal goals and then push them further. His personability, shiny head and dad jokes make him a fun and approachable coach whilst his own CrossFit credentials (massive deadlift, surprisingly good at gymnastics for a power lifter, can even do double unders on a good day) will give members confidence that he knows what he’s talking about! Outside the box Mark loves hanging out with his family, wife Clare and kids Molly and Jack. Dave’s enthusiasm for all things CrossFit is infectious and helps him to bring great energy to classes as a coach and as a participant. He is an experienced coach and a valued member of the team at CrossFit Weymouth, having been around since its conception. Dave is passionate about helping people to move better and to achieve their full potential in the box. He leads by example with an impressive repertoire of CrossFit achievements. His nutrition is on point and is has an excellent zone recipe collection. Outside the box Dave’s work ethic continues, as a Dad to Lenny and partner to Rachel, he is a self-employed electrician and legendary guitarist and front man for a number of bands. Katie’s experience, commitment and attention to detail are a huge asset to the team at CrossFit Weymouth. Katie also has a background in education, working locally as a primary teacher. This allows Katie a natural ability to manage a busy class and facilitate personal progression, even in a group setting. In the box Katie is likely to be found tidying the plates or organising the dumbbells into weight order in between practising her impressive range of gymnastic and lifting abilities. When she isn’t training Katie loves walking her husky, Storm. Oh and by the way… Katie has one leg and sometimes two. Don’t worry – she has noticed and is pretty used to it by now! 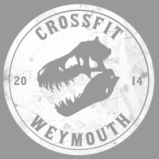 ​Nathan has been a member of CrossFit Weymouth since the early days. His progress has been consistent and his commitment has been a real inspiration to many members. Nathan has joined with Mark as a co-owner of the box and although you won’t see him at the whiteboard coaching classes, his leadership and graft behind the scenes is invaluable to the smooth running of the gym. His husband and dad duties, busy working life as a plasterer and extensive beard grooming regime keep him out of trouble when he’s not at the box.